Today's card showcases some watercolouring using Stampin' Up! 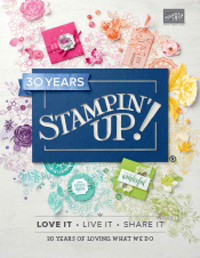 Stampin' Write Markers, Blender Pens and a lovely new stamp in the 2012/2013 Annual Catalogue called Pleasant Poppies. I got to stamp one of these images at a team stamping get together last week, and I am so glad I did as it'such a lovely stamp to colour. I used to be a bit scared of watercolouring, but then I used our fabulous quality watercolour paper and realised what a difference that made. It is so easy to blend the colours and you don't get any pilling of the paper by going over and over to blend the colours. Here's some more I coloured, this time using Aqupainters and the inside lid of my stamp pads. This stamp set is For The Birds which is a delightful collection of 7 images and greetings for all occasions. I also borrowed this stamp last week - a great perk of being part of a fabulous group of ladies who love to stamp and share. 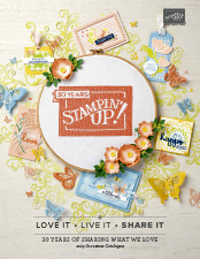 Would you like to join a group of addicted stampers who love to share and chat online and in person? We'd love to have some more addicted paper crafters join our team. Anyone is made welcome, right around Australia. You can share in the fun and ideas and ask questions for quick answers using our online team chat group. Just this week we have had several of our new team members raving about how great our chat group is and how connected and supported they feel. October is a great month to join because the way the quarters work, you have until the end of March 2013 to meet your first quarters minimum. To be honest even our hobby demonstrators have no trouble meeting their quarterly minimums of $400 before demo discount. So many ideas and inspiration floating around on our team forum! 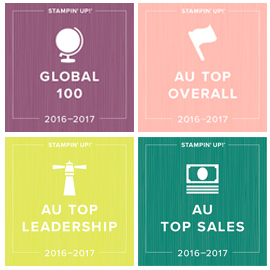 It doesn't matter what you can consider your stamping ability to be, where you live or whether you would like to join just for yourself, or for some one on one help from me to earn some spare cash for Christmas or to build a business. Whatever you want to do with it we are here to welcome and support you. Here's more information about the great benefits for hobby demonstrators, and you can call me on 03 9735 2946 or email me anytime to ask questions. You know that lovely new stitched satin 5/8" 2012-14 In-Colour ribbon that Stampin' Up! have introduced in this years Annual Catalogue? Well how would you like a free roll of ribbon (9.1m)? That's what you get with every $60 you spend in October! 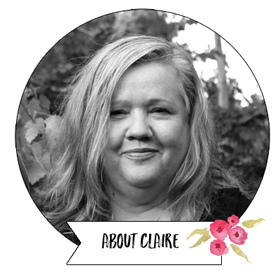 You can order online anytime by emailing me your order and having it sent anywhere in Australia. Of course the special also covers workshops and class orders, and you can earn more than 1 roll - you get one roll for every $60 spent! You can choose the colour from L-R Gunball Green, Midnight Muse, Primrose Petals, Raspberry Ripple, Summer Starfruit. Here's a quick Christmas card I whipped up using Gunball Green which perfectly matches our Be of Good Cheer Christmas Paper.